The brand Lindy Bop has only been around since 2011 but has already become internationally established in this short time. And it's no surprise given the playful elegance and tasteful design which set the clothes from this brand apart from the others. With Lindy Bop you're making a statement about exciting vintage fashion and against the monotonous designs in modern mainstream.Do you think of swing as an expression of timelessly good music, elegance and a sense of style? 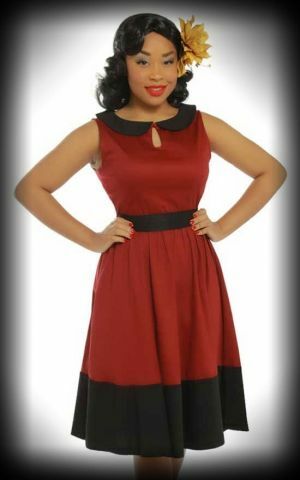 Vintage fashion from Lindy Bop gives you the opportunity to show off your passion while looking great. 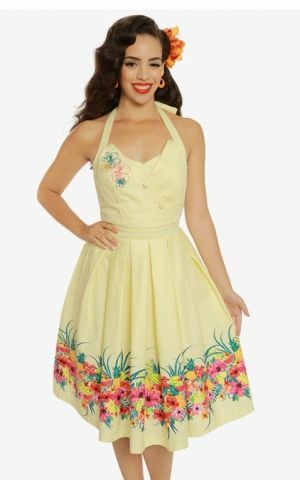 These vintage dresses with floral patterns or 1950s polka dots will have you turning heads on and off the dance floor. But that's not an excuse not to join the party! Sleeveless, light designs from Lindy Bop guarantee you plenty of movement when you start feeling the beat. Look funky and audacious whether it's swing or rockabilly. These designs are also perfect for summer - a nice airy knee-length dress will stop you getting too hot. Experience the timeless elegance for yourself in our vintage online shop. Lindy Bop Swing Dress "Terri Lou"
Lindy Bop Set Swing Dress and Bolero "Libby"